Soil erosion in hilly areas of the Sichuan Basin is a serious concern over sustainable crop production and sound ecosystem. 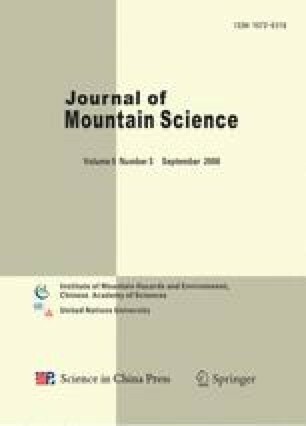 A 3-year experiment was conducted using the method of runoff plots to examine the effects of terracing and agroforestry in farmland systems on soil and water conservation of slope fields in the hilly areas in Jianyang County, Sichuan Province, Southwestern China. A power function (Y = aX b) can statistically describe the relationship between water runoff (Y) and rainfall (X). The regression equation for the treatment of sloping terraces with crops (Plot 2) is remarkably different from that for the treatment of sloping terraces with grasses and trees (Plot 1) and the conventional up-and down-slope crop system (Plot 3) regarding equation coefficients, while regression equations are similar between Plot 1 and Plot 3. Water runoff amount and runoff coefficient of slope fields increased by 21.5∼41.0 % and 27.5 ∼ 69.7 % respectively, compared to those of sloping terraces, suggesting that terracing notably reduced the water runoff in the field. In the case of sloping terraces, lower amount of water runoff was observed on sloping terraces with crops than on sloping terraces with grasses and trees. Sediment yields on the slope fields in the normal year of rainfall distribution were notably higher (34.41 ∼ 331.67 % and 37.06 ∼ 403.44 % for Plot 1 and Plot 2, respectively) than those on sloping terraces, implying that terracing also plays a significant role in the reduction in soil erosion. It is suggested that terracing with crops is significantly effective for soil and water conservation in cultivated farmland, while the conventional practice of up-and down-slope cultivation creates high rates of water runoff and soil sediment transport. Terracing with grasses and fruit trees shows a less reduction in water runoff than terracing with crops, which was observed in the 3-year experiments.